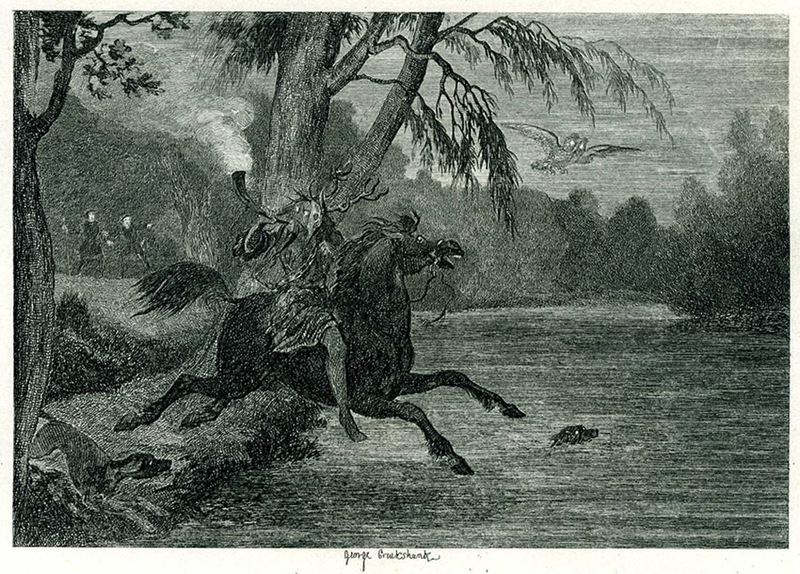 Herne the Hunter is a figure from English folklore. In life Herne is said to have been a Keeper of Windsor Forest. The legend varies between sources as to when he was alive. Some say he was a keeper during Richard II’s reign but others suggest it was during Elizabeth I’s reign. Most sources agree that he hung himself from a tree one night, either after being accused of committing a terrible crime or because of more mysterious circumstances, such as being cursed by a magician. The tree is now referred to as Herne’s Oak. He is a portrayed as a horned huntsmen who continues to lead a spectral hunt through Windsor Forest. He is considered to be a localised God of the Hunt in Berkshire, probably based off of Cernunnos. Cernunnos is part of Celtic mythology and is the Wild God of the Forest. He is also horned and associated with lust, fertility and nature.